Cities may file for bankruptcy, which can change the structure of their debt obligations. 1. Do You Pay Taxes on Pensions From the State You Retired In or the State You're Living In? 3. Can My Company Change My Pension Plan Payout? Municipal bankruptcies can affect the pension funds and pension obligations of the city in question. Although cities are legally obligated to pay retirees their pensions, in the event of bankruptcy, there is precedent for cutting pension payments in favor of paying out to bondholders, and cities can stop pension payments while the bankruptcy case is in progress. The previous example of Central Falls in Rhode Island illustrates this phenomenon, and Detroit may be next. When a city accumulates a large amount of debt that it fears it cannot pay off, it may file for bankruptcy. Cities in bankruptcy court are attempting to negotiate a new structure for their debt, reducing some obligations and cutting others entirely. In any case, the city is not obligated to pay any debts while the bankruptcy is ongoing, so it does not need to make pension payments for the duration of the case. Because many cities raise money by selling debt in the form of bonds, the obligation to pay bondholders is often a large part of a city's debt. Pension funds are another. Bondholder obligations are first in line, legally, to receive money, so if the city has little money left after paying off bondholders, it might cut pension payments. Some state constitutions, like that of California, legally oblige cities to pay city workers' pensions, but city bankruptcy is a matter of federal law, so this protection is not ironclad. The city of Central Falls, R.I., declared bankruptcy in 2011, largely as a result of generous pensions and health benefits for city workers. The city had $6 million in budget deficits and $60 million in future pension and benefits obligations. After a 15-month process, the city raised taxes, built a new budget, paid off its bondholders and cut pension obligations by as much as 55 percent. 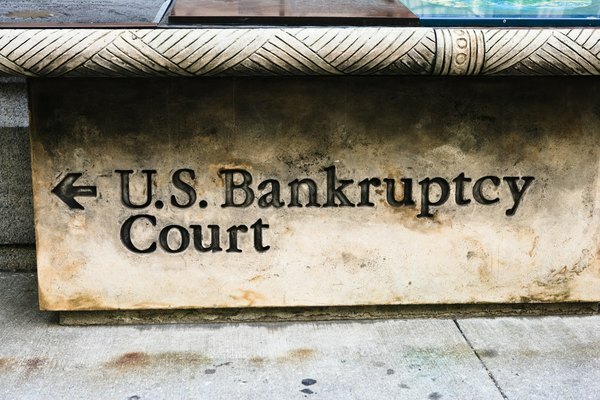 The ongoing bankruptcy of Detroit, Mich., may lead to new precedents in the level of control bankrupt cities have over their pension obligations. Detroit had $18.5 billion in debt at the time of filing its bankruptcy, and $3.5 billion of that was unfunded pension obligations. Detroit is the largest city bankruptcy in U.S. history, and the city's emergency manager seeks to cut its huge pension obligations. However, this conflicts with state law protecting pensions, so the outcome of the bankruptcy case will set a precedent for how state laws and city obligations interact in the case of pensions. CNBC: If Detroit cuts pensions, will your city be next? Can 401K Funds Be Subject to Garnishment for Credit Card Debt? If My Bond Is in Default Will I Still Get Par Value at Maturity? Is a Retirement Pension Taxable?